Are you looking to start a home gym, or want to improve your current one on a budget? There are many power racks available, and you can get one without it costing you a fortune. A power rack is an excellent addition to a home gym, as long as it is good quality and well built. We will look at three in this article that could be just the thing you need to take your weight training to the next level. These power racks are suitable for both the beginner and the more experienced weight lifter, and will give you back what you put in. The right power rack is safe, strong and durable. Many home gyms have power racks with a wide range of accessories, but you can get away with a minimal set-up if you know what to look for. The key is doing your research to find out what you need, and what is a luxury. You’ll also need to take into account how much space you have, and whether or not you’re able to anchor your rack to the floor. Your priorities and needs will depend on where you’re putting your rack, and what you want to do with it. You will need equipment to make the most out of your power rack, but can get away with a good set of weights and an Olympic barbell. You can use a power rack to build muscle and improve strength. Some power racks are very basic, and allow you to do some squats and bench exercises if you own one. Others will accommodate many body weight exercises and feature accessories that help you carry out a lot of different weight training routines. If you know what you’re looking for, you’ll be able to narrow your choice down to a rack that you’ll get plenty of use out of. It’s a good idea to invest in one that will last you for a while. 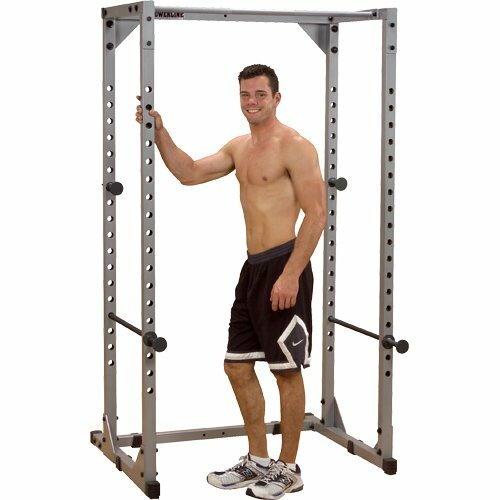 This rack has a good, wide size, which gives you plenty of space inside the cage to carry out your exercises. This model allows you to do a range of exercises, and can be fitted with accessories. You’ll be able to comfortable squat and bench within this rack. It’s also adjustable so you’ll be able to fit it to meet your height requirements. It is sold at a great entry price level, and you can also purchase the option of expert assembly if you don’t feel that you can build it yourself. This power rack by Valor Fitness has a 2.5 by 2.5 inch frame. This makes it compatible with plenty of accessories to make the rack even more versatile. It has a squat rack and pull up station which you can use for a range of exercises. There is plenty of space to add utility benches, giving you even more scope to expand your weight training routine. It features a sturdy construction, using a 12 gauge steel frame. The design provides a lot of stability which will make you feel secure when you carry out heavy lifting. You can adjust the bar supports to fit your height and your lifting needs. To make the most out of your squats and lifts, use the cage to give you that extra safety blanket. This power rack has weight holders that fit standard weights, rather than Olympic weights. 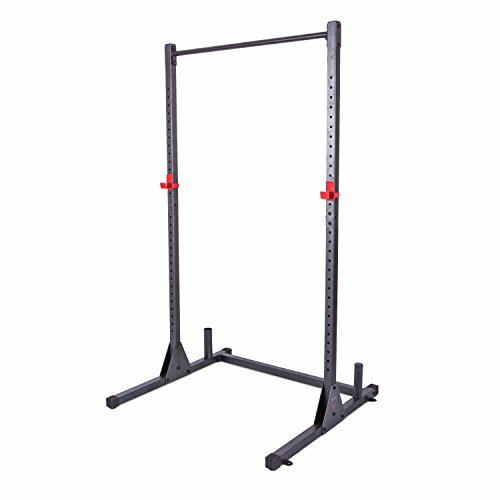 This power rack is a much more basic construction than the other two models, but is a good introductory piece of equipment to using a barbell with a rack. 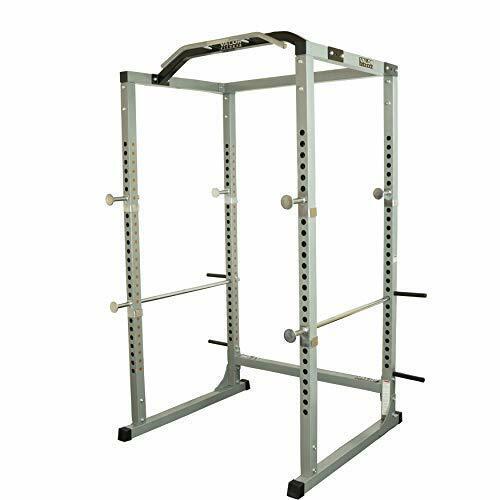 You can also use this rack for pull ups and some resistance band activities. You can also use it with a bench, by adjusting the squat rack down low. It provides much of the same functionality as the above racks, but without the large size cage area. The CAP Barbell power rack is constructed from 12 and 14 gauge steel, which are powder coated and sealed. Using a power rack at home is a great way to enhance your strength and fitness. They are convenient multi-purpose pieces of equipment that give you the space and safety to do bodyweight and weight plate exercises. If you’re not ready to invest in a barbell and set of weights, you can still use a power rack with your own weight and resistance bands for an effective workout. However, a power rack is excellent for use with weight training. If you’re interested in building your strength from a convenient and safe base at home, consider investing in a power rack. They can help you to meet your strength goals, faster. yourowngymzone.com is a participant in the Amazon Services LLC Associates Program, an affiliate advertising program designed to provide a means for sites to earn advertising fees by advertising and linking to Amazon.com. Amazon and the Amazon logo are trademarks of Amazon.com, Inc or its affiliates.